Cranberries are widely used to make sauces, jelly and a refreshing juice drink. Like many juices, they are a good source of vitamin C and were traditionally used to prevent and treat scurvy. They also provide useful amounts of other vitamins (B1, B2, B3, B5, B6, C, E, K) and minerals (calcium, iron, magnesium, manganese and zinc) but their greatest health benefits come from their unique blend of antioxidants. Known as type-A proanthocyanidins (PACs) these have a powerful antibacterial action and are classed as anti-adhesins. This is because they bind to the landing gear of certain bacteria, blocking their ability to stick to cells lining the mouth, intestines and urinary tract. As a result, bacteria are unable to attach to their usual binding sites or build up to form a ‘biofilm’ to invade body tissues. Instead, the bacteria which are unable to stick are flushed from the body without causing symptoms. For women or children with recurrent cystitis, drinking 300 ml cranberry juice (25% strength) daily almost halves the risk of developing urinary symptoms. Cranberry fruit solids also have anti-adhesin properties to help prevent urinary tract infections. A six month trial compared cranberry extracts with low-dose antibiotics (trimethoprim) in 137 women who had experienced two or more recurrent urinary infections in the previous year. 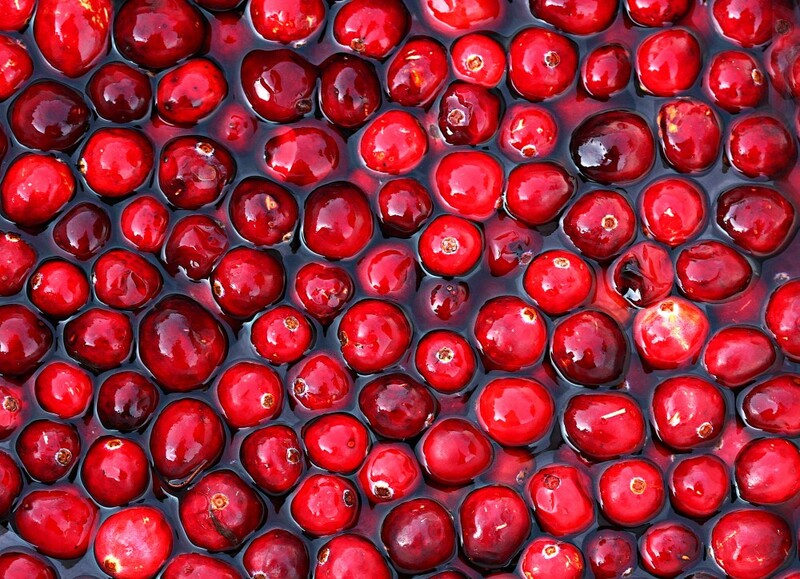 The average time to first recurrence of a urinary infection was similar in both groups and, although more women taking cranberry experienced a UTI (25 versus 14), the antibiotics produced more adverse events, with those taking them being twice as likely to withdraw from the study as those taking cranberry. The authors concluded that antibiotic treatment offered only a limited advantage over cranberry extracts in preventing recurrent UTIs. Now that antibiotic prescriptions are under intense scrutiny, cranberry is likely to experience an increase in popularity to help prevent cystitis symptoms. Cranberry juice is naturally sour as it has a similar level of sugar and acidity to lemon juice. To make an acceptable drink, the juice is diluted to around 27% juice concentration, and sweetened to around the same level as apple or grape juice. Low-sugar versions made with artificial sweeteners are available, too. Dried cranberries can be added to muesli, granola and paleo-style bars, and are increasingly included in healthy fruit and nut mixes. And cranberry sauce doesn’t have to be reserved for Christmas turkeys – it goes well with all types of meat and cheese at any time of year! If taking a supplement, look for ones with a high PAC content.